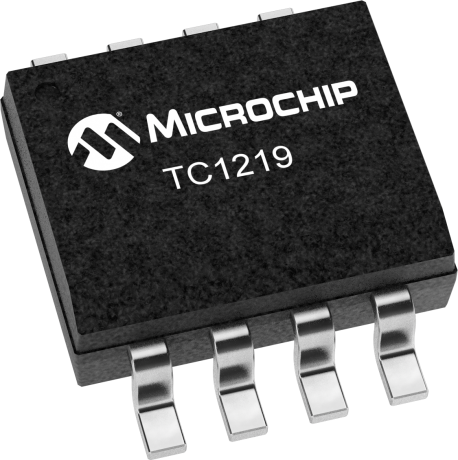 The TC1219/1220 are CMOS "charge-pump" voltage converters in ultra-small 6-Pin SOT-23A packages. They invert and/or double an input voltage which can range from +2.5V to +5.5V. Conversion efficiency is typically >95%. Switching frequency is 12 KHz for the TC1219, 35 KHz for the TC1220. When the shutdown pin is held at a logic low, the device goes into a very low power mode of operation, consuming less than 1 µA of supply current. External component requirement is only two capacitors for standard voltage inverter applications. With a few additional components a positive doubler can also be built. All other circuitry, including control, oscillator, power MOSFETs are integrated on-chip. Typical supply currents are 60 µA (TC1219), 115 µA (TC1220). All devices are available in 6-pin SOT-23A surface mount packages.